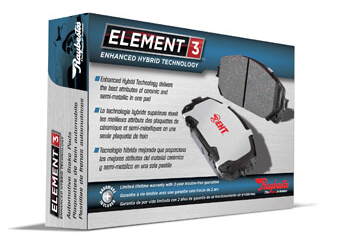 Providing unsurpassed stopping power, Element 3 EHT Enhanced Hybrid Technology offers the best attributes of ceramic and semi-metallic all in one pad. Engineered for maximum control in all conditions, and formulated for long life, less noise, and reduced dust. EHT Enhanced Hybrid Technology delivers endurance and exceptional braking.